In the past I have seen fellow bloggers share blog post of their fails in the kitchen, I thought I would share some food related photographs that did not make a blog post in their own right. 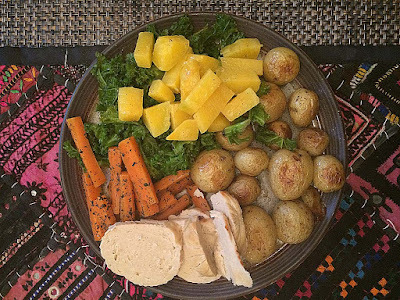 Here is a vegetarian roast dinner with mock 'meat' slices. I loved the colours but the presentation let me down. I have been making Courgetti for a while, but never featured it as the final dish always looks a bit scraggy. This dish made with new potatoes, cherry tomatoes and black olives is called Airport Potatoes. It is a recipe that I have made twice with home grown cherry tomatoes. It was bookmarked from Good Cooking: The New Essentials by Jill Dupleix tasted utterly gorgeous, but it looked an utter squishy mess. This Roasted cauliflower salad with kale and sun dried tomatoes just did not photograph well and looked a bit insipid. 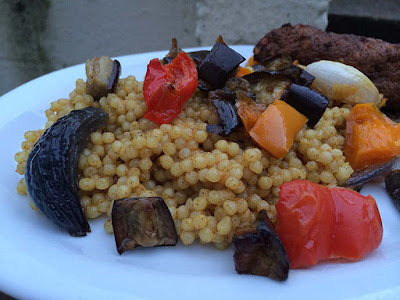 Below is an Jumbo or Giant Israeli Couscous that looked like slug eggs and the roasted summer vegetables, did not not enliven it either. What made it look even worse was the serving it with a Moroccan Kofta that looked very unappetising on the side that I was embarrassed to share it without seeing the funny side. I bookmarked a Warm Brussels Sprouts Salad recipe from a new cookbook and it just looked an utter mess that I did not have the heart to share it. I had been given some fresh homegrown green chickpeas by my mother last year and was excited to make this savoury fresh green chickpea rice, but but I snapped it with my little phone and it did the dish no favours. This is a Root Vegetable Stew made only a couple of months ago also snapped late in the evening on my little phone. This is a Aloo Gobi Curry looking so yellow. 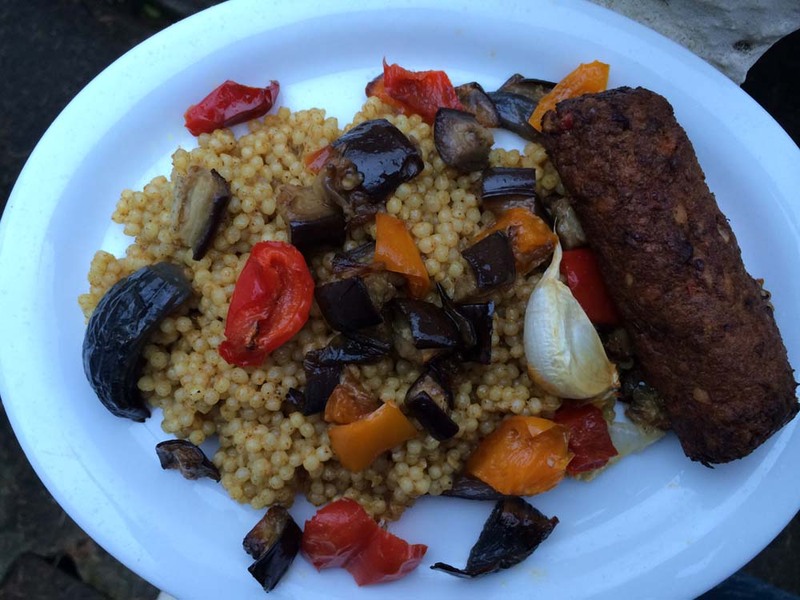 As vital wheat gluten becomes readily available in the UK, my seitan mock meat experiments continue. 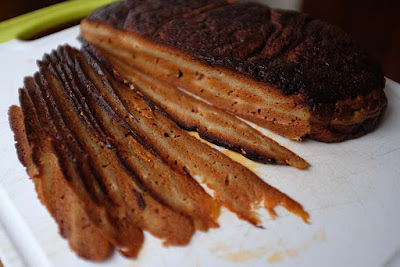 This is seitan bacon. It tasted alright, but it looked so brown. I am sure I will share more not so pretty dishes in the future. Do you have pictures tucked away in virtual files unfit for sharing and food blogging ? You are so right -- many delicious combination dishes look really pukey in photos. When everything is in little pieces, all mashed up, monochromatic, or otherwise not pretty, you just get icky pics. The real pros (that's photographers, not cooks) figure out tricks like putting a little bit on a spoon and having only the spoon in focus and the rest blurry. Or they arrange the nice bits on top and the monochrome parts underneath. Or change the color somehow. I haven't figured out how to do this. Thanks Mae :) I agree pukey is a word that does come to mind sometimes. And monochromatic indeed. The good pohotographs on this blog come from my husband who is an amateur photographer, but i love that as no fakery going on. This post is fun. I particularly like the airport potatoes - looks so soggy but sounds delicious. I hate it when a tasty dish looks awful but I think I get more annoyed at dishes that I make an effort to photograph well and it tastes disappointing. Thank Johanna. The airport potatoes were delicious, really - i made them twice! I'm so glad you shared these. If we all waited for perfect photographs before sharing a dish, so many good recipes would go unshared (or at least that's what I tell myself when I post sub-par photos anyway). These days I have poor photos but also am guilty of no photos, which is worse, as then I really can't share things. Winter light doesn't help but sometimes it's just my carelessness. Most of those look alright, particularly the Airport potatoes and the mock roast, but I'm entirely with you on the slug eggs! Thank you for being kind Debra. I actually laughed out loud at the kofta - I clearly have the same sense of humour as a five year old. I think we need to have some sort of annual veggie/vegan food fail day, where we post our less than beautiful pics. Your descriptions were beautifully crafted, even if the dishes didn't turn out quite as well as you might have hoped! You are not alone Joey. My husband thought the same when I served it up actually. I agree we should have an annual vegie/vegan food fail day where we all come and share those pictures! 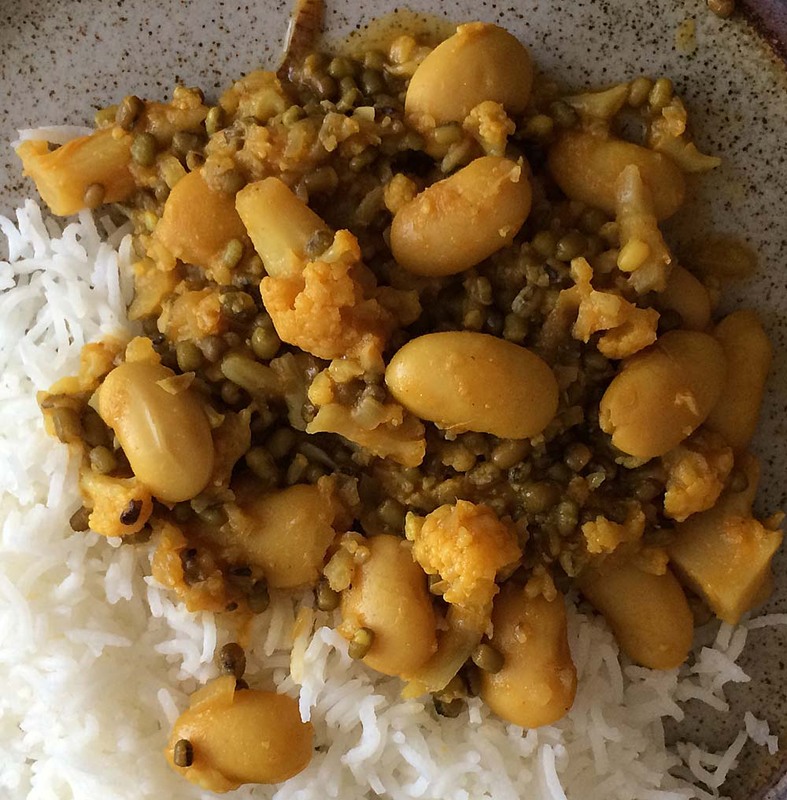 I am glad you like the green chickpea dish. I hope to get some more this year from my mother and hope to do it justice for a blog post in its own right, though. I've considered not posting recipes--or not including photos since I'm not terribly stellar (or diligent) about making them excellent. Of course, my blog isn't primarily a food blog either, so I am sure you feel it necessary to hold yourself to a higher standard. You made me chuckle at "slug eggs." Ha! In the end it is all about the taste, but, oh! Isn't it the best when things are both pretty AND tasty!?! Thank you for your lovely and funny comment about the dishes. You are right, it is all about taste. I like that you posted these even though they are deemed not good for blogging. I totally love the first picture and think it's quite pretty - like the bright yellow with the greens and orange and the potatoes look perfectly cooked! Yum. The roasted cauliflower picture is really good too! As does the root vegetable stew and the curry! Thank you Kimmy. Yeah I agree the first pic. ain't all that bad. I like your goal of caring less about pictures around food blogging.